Quantum entanglement says that two particles can become intertwined so that they always share the same properties, even if they're separated in space. Now it seems particles can be entangled in time, too. Who's ready for some serious quantum weirdness? Of all the ideas in modern physics, quantum entanglement is a serious contender for the absolute strangest. Basically, entangled particles share all their quantum properties, even if they are separated by massive distances in space. The really odd part is that any changes made to the properties of one particle will instantly occur in the other particle. There are some subtle reasons why this doesn't actually violate the speed of light, but here's the short version: this is all very, very bizarre. But all experiments in quantum entanglement have focused exclusively on spatial entanglement, because seriously...isn't this already weird enough? Apparently not for physicists S. Jay Olson and Timothy C. Ralph of Australia's University of Queensland, who have figured out a series of thought experiments about how to entangle particles across time. 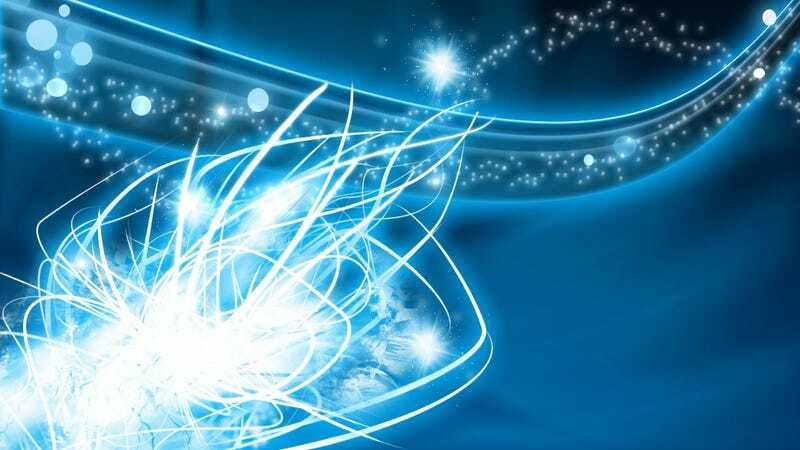 "Essentially, a detector in the past is able to ‘capture' some information on the state of the quantum field in the past, and carry it forward in time to the future — this is information that would ordinarily escape to a distant region of spacetime at the speed of light. When another detector then captures information on the state of the field in the future at the same spatial location, the two detectors can then be compared side-by-side to see if their state has become entangled in the usual sense that people are familiar with — and we find that indeed they should be entangled. This process thus takes a seemingly exotic, new concept (timelike entanglement in the field) and converts it into a familiar one (standard entanglement of two detectors at a given time in the future)." That may still be a bit confusing, so think about it this way. The detectors are basically taking on the properties of their particles - if they share the same properties, then the particles themselves are entangled. The first, "past" detector stores one set of quantum properties, and then the second, "future" detector measures a new set of properties at the same location as the first. The two sets of quantum properties are affecting each other just like spatially entangled particles share the same properties, but now it's happening across time instead. Once the two detectors are brought together in time, the entanglement becomes the more normal (well, relatively speaking) sort of spatial entanglement. This may seem difficult to comprehend - I know I'm struggling with it - but that's because we're accustomed to temporal events always being completely independent of one another. Both types of entanglement are counter-intuitive, to be sure, but it's easier for us to imagine particles sharing properties in different parts of space than it is different parts of time because we ourselves move through space so easily. And yet, from a physics perspective, there isn't all that much of a difference between space and time, and certainly not enough to rule out temporal entanglement. Now, this is all still just hypothetical for the time being, but there is a theoretical basis for this and it may soon be possible to probe these ideas further with some experiments. Still, if you're up for a bit of extra credit weirdness, here's Olson and Ralph's thought experiment for teleportation through time. Let's say you want to move a quantum state, or qubit, through time. You'll need one detector coupled to a field in the "past" and another coupled to the same field in the "future." The first detector stores the information on the qubit and generates some data on how the qubit can be found again. The qubit is then teleported through time, effectively skipping the period in between the past and future detectors. The first detector is removed and the second detector is put in precisely the same place, keeping the spatial symmetry in tact. The second detector eventually receives the necessary information from the first, and then it uses this to bring the qubit back, reconstructing it in the future. There's a weird time symmetry to all this - let's say the qubit is teleported at 12:00 and the first detector gather its information at 11:45. That fifteen-minute gap must exist in both direction, and it's impossible to reconstruct the qubit until 12:15 rolls around. Obviously, these are all deeply strange, epically counter-intuitive ideas right at the bleeding edge of what modern physics can conceptualize. But it's also very awesome. And as soon as I even begin to understand it, I'm sure it'll get even more awesome.